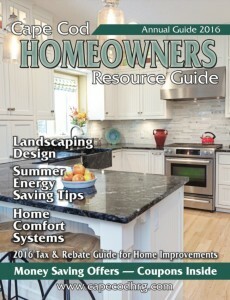 Welcome to the online edition of the Cape Cod Homeowners Resource Guide. You can count on the Cape Cod Homeowners Resource Guide for tips about protecting & maintaining your home, increasing your knowledge about home renovations or projects you are considering, and many other purchasing decisions. Homeowners can read articles filled with practical advice regarding the upkeep and maintenance that is essential to a home, so you are better able to make informed buying decisions. You can also rely on the Cape Cod Homeowners Resource Guide to provide you with coupons for many of your purchases across Cape Cod, including restaurants, automotive maintenance, entertainment and more!